Next door The Lake House on Cass Lake, LLC - VRBO #90352. Rent both for further discount. There is also a discounted rate by the week. We are located Cass Lake Bay, the bay closest to the State Park, Dodge Park #4. The boat launch is very convenient if you are bringing your boat or plan to rent one. There are cleats for docking two boats at each house next to the boardwalk. You can fish right off the board walk. We have some fishing poles you can use. A swim dock equipped with a ladder is waiting for you to just dive in. The moment you walk into the Sunset Cottage, you'll feel like you're home with central air and wifi. The open floor plan invites you outside to two large decks where you'll be kicking back and maybe catching a glimpse of swans fly over the bay! Enjoy the boardwalk and have your favorite beverage in the booth under the weeping willow tree. This spacious yard is great for a game of bocce or bean bag toss. There is a gas barbecue and three umbrella tables to accommodate 20. Relax in the 'Big Daddy' double Adirondack chairs. Toast some marshmallows over the the bonfire pit. For privacy, 18 evergreen trees line the property. Cass Lake Bay is ideal for kayaks and paddle boards as it is a no-wake bay. At the beginning of the bay it opens up into the all-sports Cass Lake where you will want a pontoon boat to cruise the 1280 acre lake and see some of the unique homes and 20,000 plus sq. ft. mansions. Located on Cass Lake Bay in Oakland County. 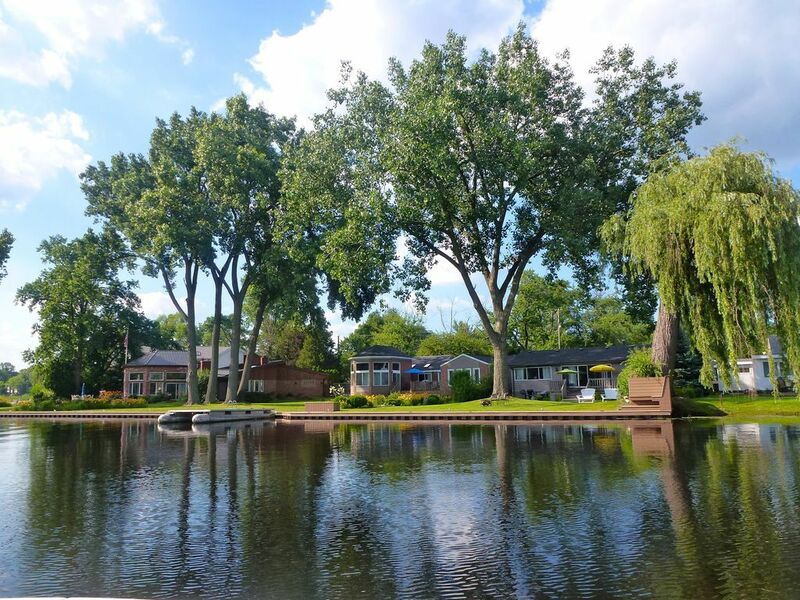 Cass Lake is so large it changes cities four times: Keego Harbor, Orchard Lake, West Bloomfield, and Waterford Township and is the largest inland all-sports lake in Southeastern Michigan. overlooks the living room. Plenty of dishes and glasses for your family and friends. Ten minutes away is the Farmers Market open on Tuesday, Thursday and Saturday from 6AM to 1PM. The living room offers a view of the decks and bay with two sofas and a recliner, including a leather queen sofa bed, with a memory foam mattress. The master suite has a queen four post bed, recliner, flat screen HDTV and private bathroom with shower. The lakefront bedroom has a queen-size bed and full size bed with HDTV and a full length leather sofa. The third bedroom has a queen bed and HDTV. The house is equipped with a washer and dryer. Three bedrooms plus queen sofa bed. Two and a half bathrooms. Enough about us.......it's all about YOU and your family and guests. Having fun and relaxing and eating and playing!! Why This Property? 'Cuz Cass Lake is the best!! The unique benefits on the bay? It's not crazy busy on the bay. When boats parade through on a lazy afternoon they MUST go slowly, the "no-wake" is perfect for paddle boarding, kayaks and canoes too. We had an Amazing time. The owner Ricca was very accommodating and answered any questions quickly thru text and email. Plenty of room for 3 couples plus children. The lake was fun and we enjoyed hanging out at the sandbars. I would Recommend this cabin to anyone. We Love the Lake House! This is our 8th summer that we have returned to the Lake House. The house is beautiful, clean and furnished with everything you could possibly need to have a comfortable stay. Personally, I love the great room. It is so beautiful and tranquil. My children have enjoyed playing in the loft year after year. They also enjoy fishing and swimming in the lake. In the evenings they love roasting marshmallows and making smores in the fire pit. The Lake House has become our home away from home and Kip and Ricca have become dear friends. We look forward to coming back for many years to come. Amazing view, and beautiful home. Great Cottage On the bay of Cass Lake!! The cottage was the perfect location for a group of friends to the spend the weekend on the lake. The cottage had a great dock capable of docking two good size boats. The location on the bay is a very short ride (5min) to the main lake. We had no problem sleeping 9 adults comfortably. The cottage had a nice deck with patio sets and a fire pit down in the lawn for an evening fire. There was enough driveway space to accommodate 5 vehicles and the owners were nice enough to let us park our pontoon boat trailer in their driveway. The owners were very responsive during our stay to any questions or concerns we had. The boat launch at the State park was also very close for convenience. We had a great time and would definitely consider to rent here again. our group including 6 adults and 4 kids really like the Sunset Cottage. The hosts Kip and Ricca were so nice. Kip gave us a tour of the lake on their boat. The lake was beautiful and peaceful. We enjoyed fishing everyday and seeing the beautiful swans. And also shopping area is so close. Would definitely return. and also the first to sit in our new "tea booth" under the weeping willow tree! We look forward to seeing you again. Not pets allowed on property inside or outside and the same at the rental next door, VRBO 90352 All cars must fit in driveway and circle and no parking on the street. Thank you.